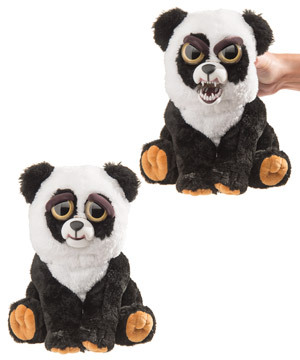 Feisty Pets: Stuffed animals that change from awwww to ahhhhh! If you have a pet (or child) you know how quickly the cute can turn crazy. 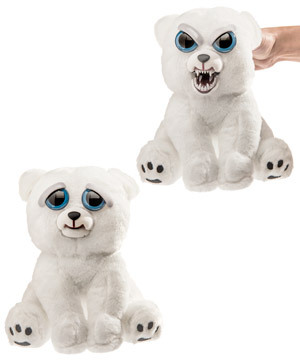 Embrace the change with Feisty Pets, a cute plush toy that turns from darling to demonic with a quick squeeze. Each two-faced critter has a pair of buttons hidden inside its head that controls its facial expression. 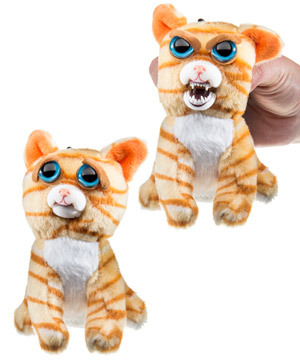 Just squeeze the back of its head and the creature will arch its eyebrows and open its mouth to reveal its vicious teeth. The shocking transformation will give a jump and a laugh to would-be cuddlers. Releasing the button restores the pet’s cute countenance, leaving no trace of the darkness that lurks beneath the innocent exterior. 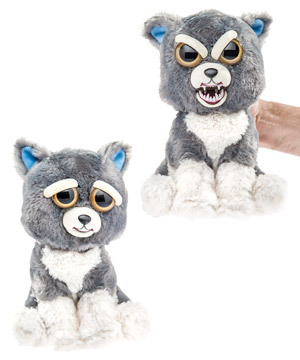 We all have a mean switch; these adorable toys just have one that’s easier to find. 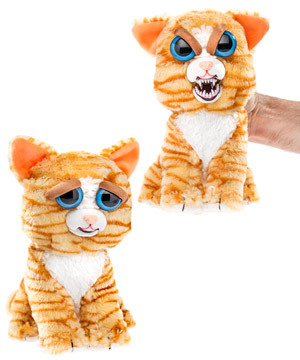 Hidden inside the head of each Feisty Pet is a trigger connected to their eyebrows and mouth. Squeeze on both sides of the trigger to release the beast: their eyebrows turn down and their smile turns into a fang-filled snarl. The sudden change makes for a good laugh and a fun surprise for friends fawning over your cute new toy. Release the trigger to restore the doll back to its default adorable expression—but know that nothing is as cute as it seems. These things are crazy cute. 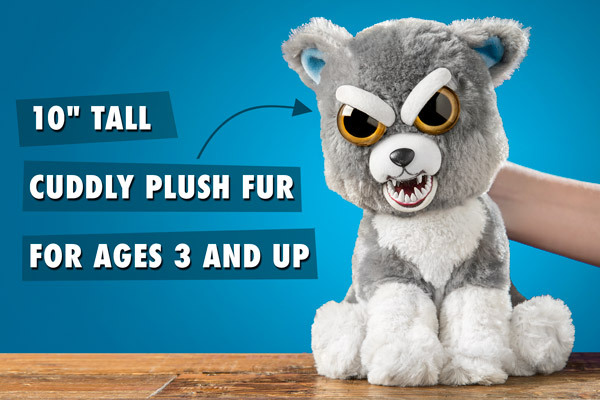 Feisty Pets are modeled after classic plush toys and, on their best behavior, they can still be used that way. 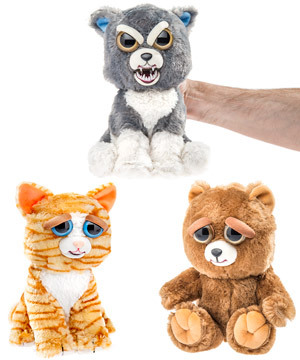 The soft fur, pillowy stuffing, and animal details make these dolls fine cuddle companions. 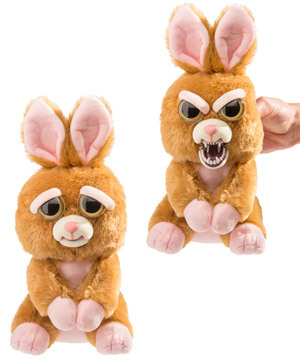 And when you need to scare off someone trying to wake you up, just squeeze the head of your two-faced critter to buy yourself some peace and quiet. You wouldn’t like me when I’m angry. 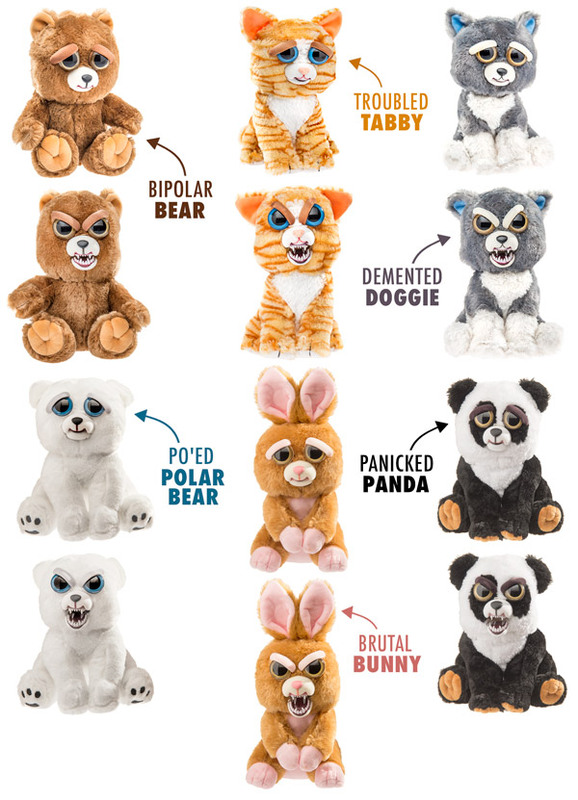 Feisty Pets are available in six deranged styles: teddy bear, cat, dog, polar bear, bunny, and panda bear. Each animal has a resting cute face that becomes demonic with a quick squeeze of their head. 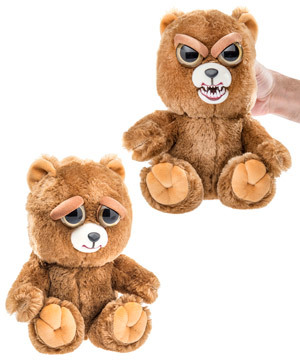 Kids will enjoy making the quick change, and adults will get a kick out of the wicked twist on stuffed animals. All animals go from snuggly to snarling in a split second. 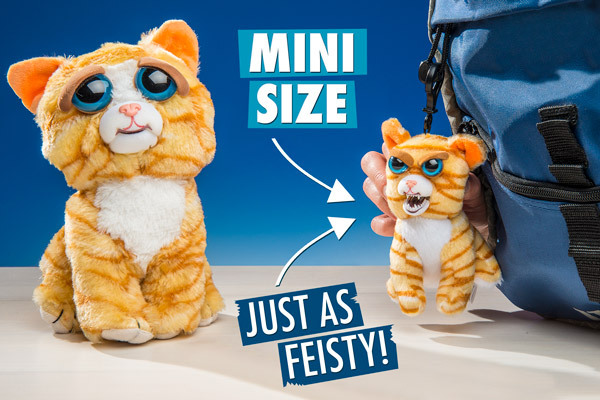 If you want to take a little feisty wherever you go, grab a Mini Feisty Pet. Just like their full-grown counterparts, these tiny terrors quickly change from cute to crazy with a quick squeeze. Their small size makes them seem even more precious (which makes their madness even more startling). 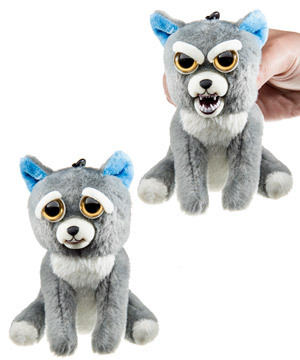 These cute/psychotic little guys have a plastic clip attached to the top of their heads so you can fasten them to your backpack, keychain, or anywhere you want to spread the madness. Everything's smaller except the rage. We challenged ourselves to write a song and produce a music video for that song in just one week. Our song is called the Feisty Freak and we hope you enjoy it! We created the Feisty Freak song and music video in the span of just one week! Question: They can't come alive, can they? Question: What kind of batteries do these use? Answer: Feisty Pets don’t require batteries! The button to change their expression is purely mechanical. Question: How long does it take to change to scary and back? Answer: The change in facial expression is instantaneous. Question: Is there a limit to how many times you can make them change? Answer: Feisty Pets can go from angelic to angry as many times as you want which, if you’re anything like us, will be a lot. Adorable and completely necessary feline hat.